With a world-renowned music scene, professional and college sports, a collaborative and entrepreneurial business community, wonderful public and private schools, a multitude of outdoor activities and unique restaurants and shopping throughout the area, there’s something for everyone in the city the world has recognized as one of America’s best. 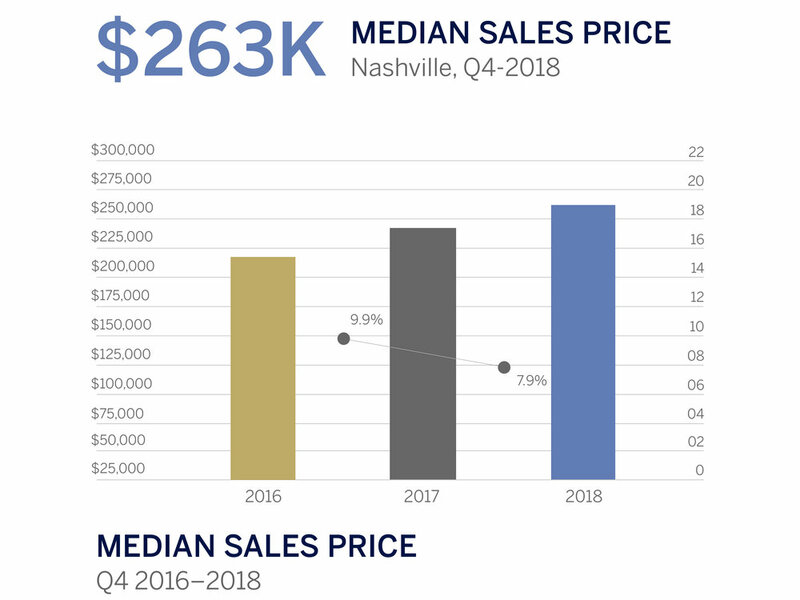 Home prices are on a steady rise in Nashville, reaching a median of $263,000 in the final quarter of 2018, a near 8 percent gain compared to the same time in the previous year. The average days on market remains steady, hovering just above or below two months. At 3.7 months of inventory, Nashville is the only balanced market among the HQ cities, as most are decidedly in favor of sellers. Given home prices and other factors, Nashville is by far the most affordable of any HQ location. Take a more in-depth look at Nashville’s real estate market here. Nashville is the only HQ city that reports a cost of living that is less than the national average, at four percent. Transportation stacks up as equal to the nation, while housing and groceries are just below the average. Utilities and health care are the only two categories with double-digit dips: utilities fall 11 percent below the national average, while health care is nearly 20 percent below the average cost in the U.S.
Nashville is the only HQ city that is considered “car-dependent,” however those that crave a walkable lifestyle need only to secure a residence within the Downtown core, East End or Historic Edgefield to easily navigate the world on two feet. Public transportation opportunities are slowly expanding in Nashville, as WeGo added 50 new buses and vans to its services last year and is in the process of updating routes, streamlining offerings, and implementing an electronic fare payment option. Conveniently situated between downtown Nashville and southern suburbs, such as Brentwood and Franklin, sits Green Hills. Here you’ll find family-oriented neighborhoods, great schools, convenient restaurants and shops, with university campuses and historic Music Row serving as unofficial borders to other areas of the city. Home to trendy restaurants, night spots and shopping, The Gulch is in the heart of the action and adjacent to downtown. There are numerous residential options within the district that feeds off its contagious energy. Voted “America’s Best Main Street” and it lives up to the moniker. Surrounded by historic battlefields and bucolic hillsides (and offering the best public schools in the state) Franklin has historic homes and planned communities, unique local shops, restaurants, outdoor activities and Southern charm to spare. Part of Nashville's DNA, Loveless Cafe offers homemade Southern comfort food on the property of a historic motel at the foot of the scenic Natchez Trace Parkway. Sprawling and gorgeous gardens, art installations and comfortable hikes in the fabled Belle Meade area of Nashville. A must for concert-goers, the “Mother Church” of country music offers an intimate setting where legends of all music genres regularly play. Nearly the mildest climate of them all. On many counts, the climate in Nashville is a mild one. There is little snowfall, summer temperatures generally reach the high 80s, and residents and visitors alike enjoy 205 days of sunshine on average. Nashville is a wet one, however, with average rainfall that even beats Seattle, at 50 inches per year. If you’re considering a move to Nashville, we’re here to help! Browse a variety of home options below or get in touch with an agent to discuss your real estate—and HQ—goals. Looking for that perfect single-family home? Browse a collection of stellar residences in Nashville. If you want the convenience of a lock-and-leave lifestyle in an urban setting, be sure to check out these condos. Take a look at the development homeownership opportunities currently available in the Nashville region. Reach out to connect with an agent and explore properties in the Nashville area.